12.00 " x 12.00 "
Iconic structures all across rural America are vanishing. The barns, coal sheds, farmhouses, grain towers, train depots and outbuildings that are the foundation on which our rural heritage was built upon; the ordinary and the extraordinary. Sadly, they disappearing at an alarming rate. 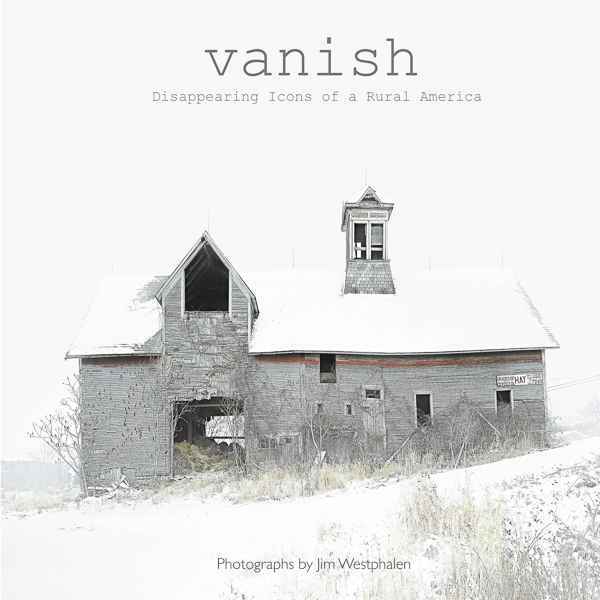 Photographer, Jim Westphalen’s VANISH - Disappearing icons of a rural America celebrates not only what these structures once were, but what they have now become. In this 106 page, full-color 12’ x 12” book, Jim captures the very soul of these fading treasures. Each image is also accompanied by historic notes and anecdotes, adding to the richness of the viewing experience. Many of us pass these structures often, but most barely give notice until one day we see a pile of rubble and ask, “Wasn't there a barn there?” May this collection of images be motivation for us to open our eyes and appreciate what we have for this brief moment in time. May it prompt us to connect with our older generation and those who know the history of the landscape before they too are no longer with us. And finally, may it be an encouragement to treasure these structures now, for sadly most will eventually succumb and fold into the soil on which they were built upon, taking their stories with them.